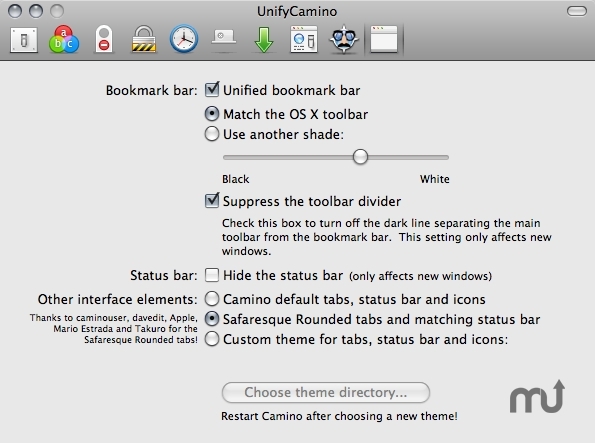 Changes color of Camino bookmarks toolbar and more. Is there a better alternative to UnifyCamino? Is UnifyCamino really the best app in Browsers category? Will UnifyCamino work good on macOS 10.13.4? UnifyCamino is a plugin for the Camino Web browser. It changes the colour of the bookmarks toolbar so that it matches the 'unified' toolbar look on Mac OS X. Optionally, it can also apply a streamlined look to the tabs and status bar, or apply any custom theme to the whole Camino interface. Version 1.94b: Release notes were unavailable when this listing was updated. UnifyCamino needs a rating. Be the first to rate this app and get the discussion started!